After talking to a new friend on LinkedIn who advocates the Esselstyn type of vegan diet, I realized it would be good for hubby and me to eat more oil free meals. I’m trying to cut back on starchy carbs to get in better shape. We both need to watch fats and oils to avoid heart issues. She’s doing it right, and I can do better with my diet. So tonight, I perused my fridge in search of something a little different and came up with this curry. It has no oil, no starches and still satisfies. You can substitute any veggies you have on hand to equal about 4 1/2 cups; it’s really the sauce that makes this dish come to life. This version is low in sodium and not hot spicy, just flavorful. Certainly, adding a little more salt and red or black pepper might be an option, but as written below, it’s super healthy and we both really enjoyed this meal. Place cauliflower in a large pot and fill with 1” of water. Bring to boil, cover, turn down heat and let simmer until soft. Combine onion, carrots, celery, kale, bok choy, broccoli and snap peas to a frying pan with a small amount of water covering the pan. Bring to boil, cover and turn down heat. Simmer about 10 minutes. Check pan of veggies and drain or steam off excess water. Pour blended sauce over veggies and simmer until hot. Remove cauliflower from pan and smash desired amount on each plate until it looks similar to rice. You can also blend the cauliflower for a mashed potato consistency. Spoon veggies and sauce over cauliflower and serve. 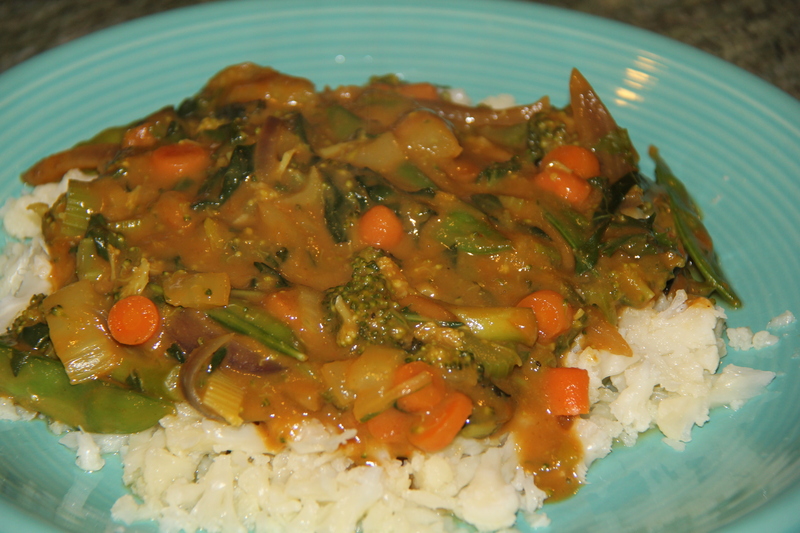 This entry was posted in main dishes, Recipes, side dishes and tagged cauliflower, curry, gluten-free, healthy, Indian recipe, no fat, no oil, no starch, oil free, recipe, sauce, vegan, vegan cooking, vegan recipes, veggies. Bookmark the permalink.